I’ve been working on this kit on and off since June last year, it’s been something of a labour of love and it’s finally complete! First off a little bit of info about this suit before the review. 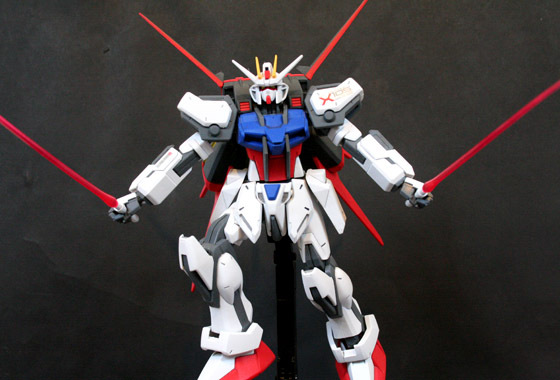 Gundam SEED started out as a reimagining of the original Mobile Suit Gundam, so the Strike Gundam is as revered by younger Gundam fans as the RX-78 is to us oldies. It’s a pretty cool design and the similarities to it’s older brother are clear when placed side by side. The color schemes are very similar, but Strike dumps alot of the yellow. 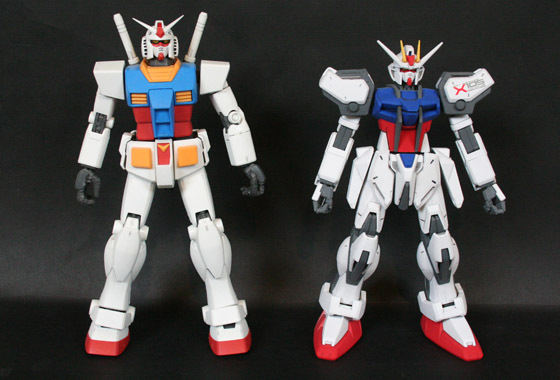 Also as with many SEED units the panelling is quite minimal in places as opposed to UC’s tendency for complete cover(Strikes Gundam Evolve version shows off even more inner frame on the arms and legs). A notable omission from this unit is the lack of a Core Fighter. 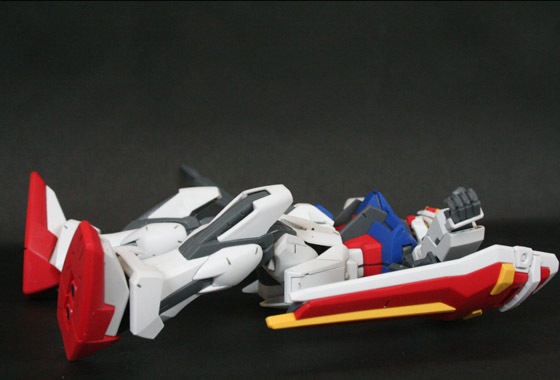 None of Kira Yamatos mobile suits are ever fitted with one, but they do make a reappearance in SEED Destiny as part of Shinn Asukas Impulse Gundam. Shadowing Mobile Suit Gundams iconic opening, Strike is thrown into a combat situation totally unprepared and underarmed during an attack on the Heliopolis colony. 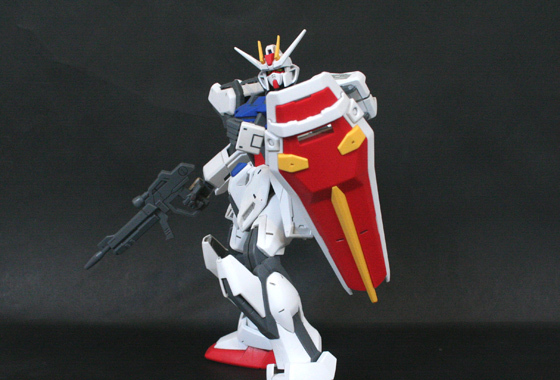 The RX-78 had it’s head cannons and a beam saber to rely on, Strike has head cannons and 2 solid ‘Armour Schnieder’ combat knives which are stored in containers in the hip side skirts. Luckily once Kira and Crew escape aboard the Archangel some more equipment becomes available to him in the form of a Beam Rifle and shield which he uses to defend the ship on many occasions. The only problem is to begin with he’s not an especially good shot, firing everywhere and wasting all his power – no reactors in these units(yet) just a big battery. Enter the Aile Striker pack! Not only does it provide those 4 awesome thrusters for extra manouverability, it’s also an extra power supply to get Kira back on his feet! It’s one of 3 main addon units(there are others in sidestorys) for Strike, allowing it to be a multipurpose unit for almost any situation. 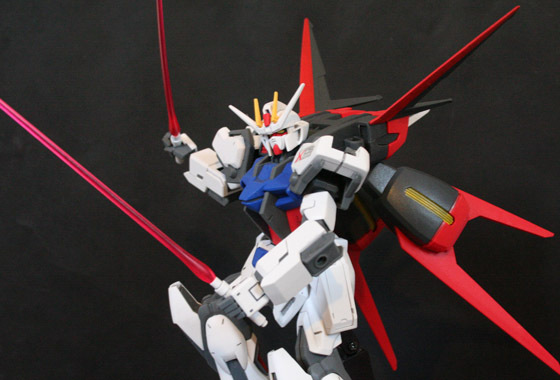 The other two are the Sword Strike – supplying a massive sword and beam boomerang, and the Launcher Strike, which consists of a gigantic beam weapon and shoulder mounted minigun. The Aile Striker also delivers 2 beam sabers for extra kickass! Looks pretty cool i’m sure you’ll agree! Right.. on with the review now! 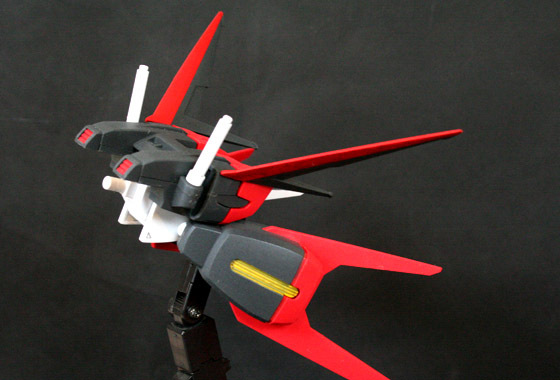 Being a 1/100 and not a Master Grade, there is not internal frame as such, and each piece and panel is usually integral to holding the kit together. Not many panels to detail here either, mainly just indents and vent holes at various points. 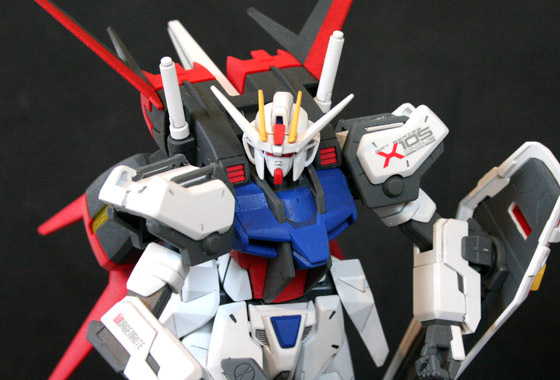 Some painting is required to complete the look, the shoulders need a bit of white paint along the top, vents on the Aile Strike need painting yellow and the top wings need masking off and painting red – well worth the time though as it looks brilliant! As mentioned in one of my progress posts, I threw away the crappy foil decals and instead opted to paint on the eyes etc. Again seeing as there’s not a huge amount of detailing to this one, taking the extra time helps finish it off I think. I’ve also experimented for the first time with water slide decals, and i’m quite impressed! The finish they give is fab and again add an extra bit of eye candy. Didn’t go too overboard though and only applied two, one on the left shoulder and there’s a Morgenrote one on the right forearm also. 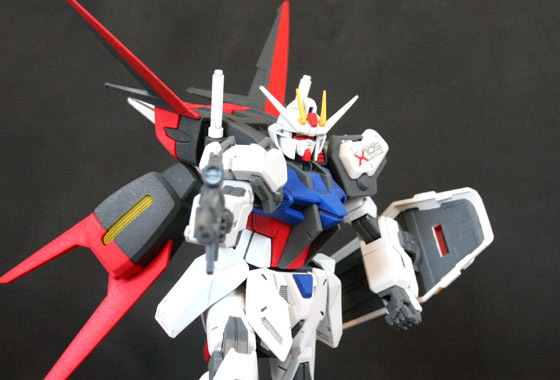 During this shoot I stupidly knocked the V-Fin off and lost the red bit. So from the picture of the striker unit onwards is a replacement I made from a piece of runner, filed down to the correct shape. Does it look terrible? The minimalist panelling makes posing a breeze, the arms can pop off if you aren’t careful though. Legs are fine too, the skirts do impede movement slightly – especially at the rear as it’s one solid piece. The feet are one big clumpy flat footed piece so it’s a little hard to pull off dynamic poses. The addition of the Aile Striker doesn’t make posing any more difficult which is a nice surprise, although it does make the whole model a bit back-heavy though so best to clip it safely into an action base. 2 x Armour Schnieder combat knives – you get 2 folded versions for the skirt compartments and 2 extended versions for use in the hands. 2x Beam Sabers – hilts clip into the Aile Striker. 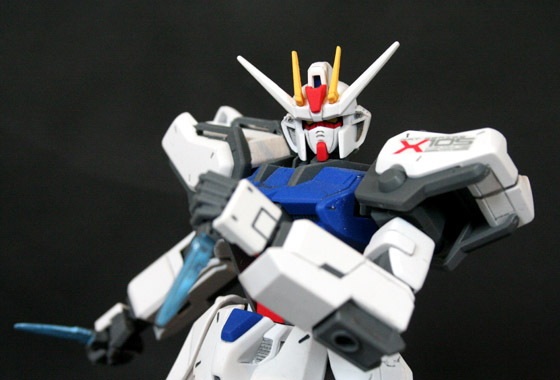 Beam cores are identical in shape to the MG RX-78, but with a much deeper colour. Beam rifle – standard SEED beam rifle with adjustable front handle for 2-handed shooting poses. All in all a pretty decent kit! And for free I really can’t knock it 🙂 I also feel like i’ve learned a whole lot while building this one which means my memories of building it will always be good ones, well apart from the stress of my V-fin destruction. Celebrate the 30yrs by getting a Gundam outfit and wearing it to work! Hehe thanks! I’m really happy with it, but 1/100 is one thing, Master Grade is a totally different matter! Same scale as this but a more parts and posability.